We offer a large variety of paving products and services to help satisfy your varying needs! Our FREE Proposals are written up to keep your budget in mind while delivering superior products and services. We specialize in Asphalt Paving, Patching, Seal Coating, Striping, Petromat Overlays, Class II Grading and Compaction, Saw Cutting, Crack Sealing, Asphalt Berms, Concrete Wheel Stops, & Concrete Swale Repair. Prior to any of the below work, secure the site by blocking work area with cones, delineators, and or caution tape. After work is completed, all debris and equipment are to be removed from the site. Removal and Replacement of major cracked and damaged asphalt: Mark-out, saw cut, and remove broken asphalt to a depth of 4”. Apply asphalt tack to saw cut edges. Install hot mix asphalt using a roller for proper compaction. Installation of class II rock: Some heavily damaged asphalt areas may require the dig out of clay and or wet sub-soil so that the asphalt can be better supported. Standard class II depths usually should range between 4” & 6” in depth. In severe cases, up to 12” of class 11 could be installed. In the case of deeper excavations (over 6”) call Dig Alert to mark out utility areas 72 hours in advance of work. Prep work prior to Asphalt Overlays: Broken and or cracked areas should be either sawcut or ground out and replaced using 3” of properly compacted asphalt. Asphalt edges alongside all concrete swales, walkways, high places in front of garages, and entrance aprons should be ground down between 1” and 1.5” so that the asphalt overlay will not create trip hazards. It is recognized that asphalt overlays may create water puddles. But, these will be minimized as much as is possible. It is recognized that any asphalt overlays and or skin patches will/may get car tire scuff marks for the first 6 months of the application. 6 months after this work, the contractor is to return one time for free and iron out the major scuff marks and touch up the seal coat over these areas. Petromat: Installation of Petromat requires that a minimum of 1” and an average of 1.5” of asphalt be installed on top of it for proper performance. Petromat must be installed no closer than 6” from the edge of the asphalt. All walking and driving edges will be feathered down to 0” so that trip hazards do not occur. Petromat should be installed using AR 4000 oil. Asphalt Overlays: Asphalt overlays that do not require Petromat will be an average of 1” thick with most edges feathered down to 0”. Asphalt overlays will be precleaned and sprayed using an SS1H asphalt oil. Asphalt Skin Patches: Clean rough and low areas, apply asphalt tack coat, and install properly compacted hot mix asphalt feathering the edges down to 0”. Asphalt tack coat all completed edges so that no future unraveling will occur. Prep work prior to asphalt sealcoating: Remove and replace any broken and or low asphalt areas. Asphalt skin patch any rough and or low areas. Scrub and blow clean asphalt work area. Clean out weeds and dirt from longitudinal cracks and install a high quality cold pour crackfiller or hot pour crackfiller. Any bad oil spots should be scrubbed and applied with an oil spot primer so that seal coat will not later peel off. Apply a high quality asphalt sealcoat using finish coat brooms so that the material will stand up better and last longer. Sealer is not to be mixed with anymore than 15% water so that its life will be extended. Secure sealed areas for a minimum of 24 hours so that they can dry without any auto traffic. Foot traffic is to be limited to already dry areas only and or unsealed marked off areas. It is recognized that scuff marks caused by the turning of car tires will occur for the first one month of the application. 1. A thorough power cleaning is performed, which consists of power blowers and special wire brooms. Areas must be scrubbed/cleaned of all dirt to insure that new sealcoat sticks. 2. Apache Asphalt applies OIL SPOT PRIMER to major oil spot areas at no extra charge to help prevent the new sealcoat from peeling. By controlling the amount of water added to our sealcoat, we are able to maintain a consistent quality and thickness. We add a maximum of 15% mixture of water to our sealcoat, which provides you with a thicker and longer lasting finish. 3. Most other companies use squeegies, which pulls the material off of the surface and shortens the life of the sealcoat. We apply the finished coat of seal with a broom, which causes the sealcoat to stand up and give you a thicker, longer lasting, coat. 4. And last of all, but most important, our crews do a neat, clean job, assuring you of quality work that will be pleasing to the eye with a nice durable finish to protect your pavement. ARE ALL SEALCOAT MATERIALS THE SAME? No! 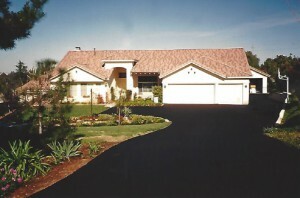 Ace Seal is a superior product to other sealcoat products available. Ace Seal contains a higher asphalt and lower filler content than other sealers, which contributes to its superior wear characteristics. Ace Seal consists of a mixture of emulsified asphalt, water, Sand, mineral fillers, and various other admixtures. Ace Seal serves to seal the top of the asphalt, preventing water from penetrating the surface of the pavement and protecting the top layer of asphalt from oxidation and wear caused by exposure to the sun and air. 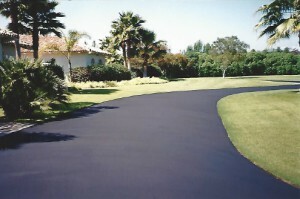 Ace Seal also beautifies the pavement by providing a smooth, black, even surface ideal for painting lines and sweeping. Ace Seal is designed for off-highway use where there are low traffic speeds and tight turning radiuses such as parking lots, mobile home parks, schools, shoulders, etc. We can stripe, re-stripe, or paint your parking lot any way that you would like it. We are well versed in ADA Guidelines so that we can bring your parking lot into compliance. We install Handicap poles with signs, paint handicap logos, red fire curbs with stencils, STOP stencils, numbers, lines, sports courts, and any kind of stencils that you would like. We also install Concrete Wheel Stops. Striping usually takes place within the same 24 hours used to allow the sealcoating to dry. This way, your parking lot can be open within the allotted time frame.